I’m reviewing Before Her Eyes by Jack Jordan today. This is my first book by this author but I’d heard so many good things that when it became available on The Pigeonhole I jumped at the chance to read it. My thanks to that site and Corvus for the opportunity. 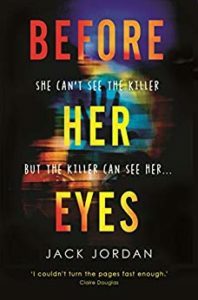 This is my first Jack Jordan book and what appealed to me particularly about Before Her Eyes was the fact that the protagonist, Naomi Hannah, is blind. It puts a different and unique slant on the story and in a town where murders are taking place and Naomi stumbles across the scene of one of them, it made for a creepy and scary premise. Naomi knows every bit of the town where she lives and she finds her way around her house by memorising where everything is. But when she seems to have become a target for someone who is cruelly tormenting her, things take a much more sinister turn. People are being killed and the police are a key part of this story, in particular DS Marcus Campbell who I liked immensely, and his superior, Lisa Elliott, who I didn’t like at all. Marcus starts to wonder if the murders are linked to the disappearance of local girl, Hayley Mitchell, 20 years ago. I thought this was a very readable crime thriller with an intriguing heroine and a twisty storyline. I loved how it all unfolded. I couldn’t see where it was going and the end was a complete shocker. I did struggle a little with Naomi’s blindness. There were elements of the story that I wasn’t sure were how a person blind since birth would behave, but I’m only guessing and I presume the author did his research. I did get quite annoyed with her foolishness at times though – there was quite a bit of “for goodness sake, Naomi!” floating around in my head whilst I was reading. But it’s certainly a page turning thriller and one which I was really intrigued by. 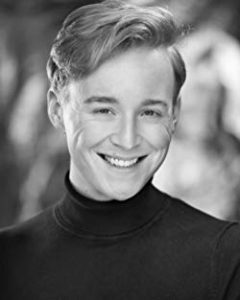 I’d definitely read another book by Jack Jordan. He certainly knows how to weave a twisted tale! I read this via Pigeonhole too Nicola and thought very much the same as you. It was a brilliant basic plot line, but got exasperating and lost some credibility. The ending was a shocker though. Going on the comments on Pigeonhole, a few others felt the same but it was still a riveting read, I thought. Yes it was a riveting read – I was desperate to find out whodunnit! Sounds like a very interesting read! I keep seeing this one around so may have to pop it onto my wishlist. Thanks for sharing your thoughts! Yes, this one is doing the rounds at the moment. It’s very good. Thanks for commenting, Faye.